Starting at Yellowstone Lake, the Yellowstone River flows north through the Grand Canyon of the Yellowstone and past Artist’s Point, where I snapped this picture of the Lower Yellowstone Falls. By now, you may have guessed where one of North America’s most impressive waterfalls is located. The Grand Canyon of the Yellowstone, located within Yellowstone National Park, Wyoming, U.S.A., like most of the park, was formed from lava flows and hydrothermal activity. The rhyolite rocks that form the walls of the canyon were deposited by felsic (silica-rich) lava flows. Rhyolite, based on mineral content alone, is much the same rock as granite. The difference here, is that granite is formed from cooling magma (term for lava when below the surface) that remains below the earth’s surface, allowing it to cool slowly and individual minerals to grow larger. When magma reaches the surface of the earth (now called lava), the exposure to air and, sometimes, water causes the lava to cool more rapidly, producing a fine-grained rock. The beautiful colors of the canyon were not only a product of multiple lava flows, creating different layers, but hydrothermal alteration of the rhyolite rock. Yellowstone N.P. is famous for its hot springs and geysers. These features were present in the Grand Canyon of the Yellowstone’s past and can still be seen there today. The high temperatures and contact with the hydrothermal waters made the rhyolite softer and more brittle, easily erodible. This helps explain why the canyon is so large, near 1,000 feet deep and half a mile wide in some places. 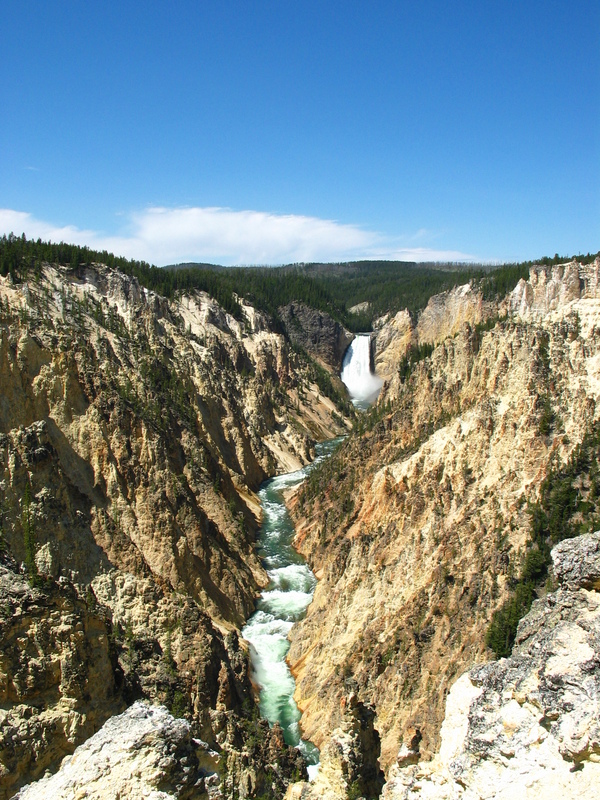 The Yellowstone River, much like the Colorado River in the Grand Canyon, was able to cut down through the soft, altered rhyolitic rocks to form the canyon and the magnificent Lower Yellowstone Falls that you see in the picture. Once exposed to the elements, the canyon walls began to change color. This, again, is a result of the previous hydrothermal activity. Chemical alterations of iron-rich layers within the rhyolite result in the red and yellowish “staining”, which occurred as a result of oxidation. The canyon walls are, in fact, rusting. Fortunately for us, this makes for a breathtaking sight. Incredible sight. I wish I had known more when I visited in the early 90’s. I couldn’t have asked for a better tour. I’ll probably never get there, but if I did, I’d not appreciate what was before me as much as your photo and description conveyed. Good job.